As we near the end of 2017, there has been a lot to take in this year in the boxing world. From highlight-reel knockouts, several of the sport’s biggest names deciding to retire, the emergence of new stars in the game, the landscape has yet again changed. This is a fight that the boxing public has been pondering for quite some time. It was years ago that Garcia started making a big name for himself by winning titles in the featherweight and junior lightweight divisions. An unexpected two-year hiatus would see Garcia (37-0, 30 KO’s) sit on the shelf from January 2014 to July of 2016, where he was going through promotional issues with his then-promoter Top Rank. In that time, Lomachenko (9-1, 7 KO’s) would see his star-status rise, as the Ukrainian fighter himself has won titles at 126 and 130 pounds while dazzling the public with his virtuoso performances. Given Garcia’s strong return in 2017, where has won the WBC lightweight title by blasting out Dejan Zlaticanin in three rounds, and then defeating Adrien Broner over 12 rounds this past July, he is again near the top of the sport. This is a fascinating matchup if it comes off. 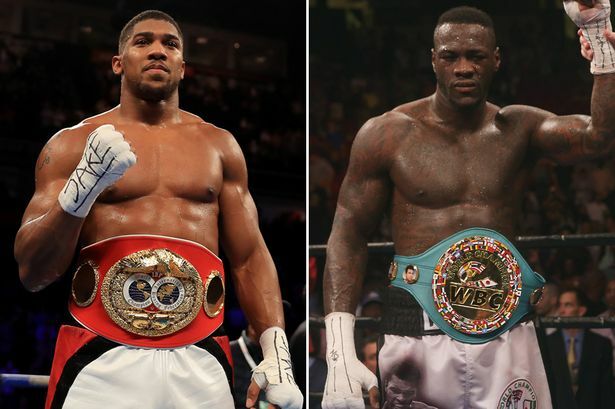 It’s been a while since we have had a heavyweight matchup resonate so much interest from the general public, but Deontay Wilder vs. Anthony Joshua is definitely the fight to make in boxing’s biggest division. And why not in 2018? Wilder (39-0, 38 KO’s), the WBC champion, is coming off an electric first-round blowout of former champion Bermane Stiverne, and Joshua (20-0, 20 KO’s) had an emphatic year, highlighted by his memorable, give-and-take battle with Wladimir Klitschko, who he defeated via 11th-round TKO in April to become “the man” at heavyweight, to many observers. It does seem that Wilder is very much more interested in the match at the moment than is Joshua, as his promoter Eddie Hearn continues to go back-and-forth on the media about a possible match. Let’s just hope we see this match at some point in time. If there is an immediate rematch in the sport that seems to make sense, this is the one. On Sep. 16, inside of the T-Mobile Arena in Las Vegas, Nev., Golovkin and Alvarez battled to a very controversial 12-round split-draw verdict that saw the reigning champion from Kazakhstan walk away with his titles. The consensus after the match was that Golvokin (37-0-1, 33 KO’s) had done enough to win a competitive match, yet Alvarez (49-1-2, 34 KO’s) did have his moments, and there are many who justify the draw verdict. Regardless of how you scored the match, there is no denying this was an excellent clash featuring’s Golovkin’s sustained pressure, power, and accuracy vs. Canelo’s improved ring smarts and counter-punching ability. A rematch will answer many questions. On June 25 of 2015, former IBF welterweight champion Shawn Porter and current WBA champion Keith ‘One Time’ Thurman faced off inside of the Barclays Center in Brooklyn, New York. Following 12 heated rounds of action, Thurman walked away with a victory via three scorecards reading 115-113. Porter (28-2-1, 17 KO’s) and his father and trainer Kenny have been adamant about a rematch, and have done everything on their end to keep Shawn’s name in the spotlight. In 2017, Porter scored clear-cut victories over Andre Berto and Adrian Granados. Thurman (28-0, 22 KO’s) fought just once, defeating Danny Garcia inside of the Barclays’ Center in March, and has since been resting a reported elbow injury. Once Thurman is ready, Porter will serve as a more-than-willing dance partner. The welterweight division, in general, is full of top-flight stars, and a matchup like this could help sort things out.